SOME of you might remember the name Washington Okumu; I bet many won’t. Let me not waste time trying to make you guess; this is the man who played a rather significant role in salvaging our 1994 moment when it almost got derailed by one Chief Mangosuthu Buthelezi’s Inkatha Freedom Party (IFP). To refresh the memories of those who were around then and to share a bit of recent history with those who were not, about four years prior to the 1994 moment South Africa had already begun to make history when the last apartheid leader, Frederik Willem de Klerk, saw it fit to continue the journey that had been begun in secret by his predecessor, Pieter Willem Botha, also known as the Groot Krokodil (Great Crocodile) for reasons not relevant to this discussion. PW Botha, aided by the National Intelligence Service, had begun secret talks with the still imprisoned Nelson Mandela, who was subsequently moved to a comfortable house on the grounds of Victor Verster Prison, now known as the Drakenstein Correctional Centre, in Paarl. They did this to make access to Mandela easier and to gradually transition him for life out of prison. Records have also shown that Mandela was even regularly driven around Cape Town by intelligence service officers without anyone recognising him. Few ordinary South Africans could, given that even fewer had been able to keep track of his maturing features during apartheid, as all publication of his photographs had been banned. Yes, that is the country we used to be! The talks with Mandela – who later roped in the exiled African National Congress (ANC) leadership for alignment and support – were aimed at testing his preparedness to negotiate a future political settlement with the apartheid regime. The latter had begun to sense that there would be no future for an apartheid state in a changing world order. With the end of the Soviet Union, the communist bloc in Eastern Europe was crumbling and the Cold War was also beginning to end. The Mandela-Botha talks remained secret for over three years until Botha left office after being ousted following a stroke. His successor, FW de Klerk, took up the baton and concluded the secret talks which culminated in the announcement, on January 2 1990, of the imminent unbanning of the ANC and other liberation movements and, on February 10, of the news that Mandela would be released the next day. The eyes of the whole world and global media were already fixed on South Africa when all these events, especially the release of Mandela on Sunday, February 11 1990, came to pass. The mood in the country was festive. While everyone – especially black people – seemed to be celebrating Mandela’s release and welcoming the imminence of a new era, a handful of Bantustan leaders, led by one Chief Mangosuthu Buthelezi and one Lucas Mangope, seemed to be at one with the worried extreme right-wing groups in their sorrow. Buthelezi and Mangope were concerned about losing their apartheid-allocated political power in KwaZulu-Natal and Bophuthatswana, respectively. 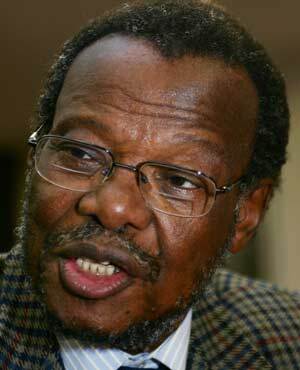 A Kenyan, Washington Okumu, was roped in together with former US secretary of state Henry Kissinger and former British foreign secretary Lord Carrington to persuade Buthelezi to hold hands with the rest of the country in forging a new, unitary order, following Buthelezi’s withdrawal of the IFP from the multi-party negotiations. Buthelezi had been refusing to settle for anything less than a federal form of government in the new South Africa with a self-governing KwaZulu-Natal, led by none other than himself. As if not satisfied with the murderous mayhem caused by his army of hostel dwellers in the townships around Johannesburg and Durban in the early 1990s – later proved to have been aided and abetted by the apartheid regime – it was said at the time that Buthelezi had threatened to go to war to get what he wanted. He only agreed to take part in the historic elections one week before they took place, thanks to Okumu’s patient, yet firm, persuasion. The electoral machinery had to grind to a halt to ensure that the IFP’s name was added to the already printed 80 million ballot papers in those last few days. Over the years since 1994, we have seen the erstwhile National Party becoming the New National Party before it finally disappeared into the bellies of the ANC and the Democratic Party, since rebranded into the current Democratic Alliance; the Freedom Front was branded into the Freedom Front Plus, but it is struggling to remain relevant. The IFP remains, albeit much weakened electorally in recent years, and so does Mangosuthu Buthelezi. Both have weathered many storms. They’ve tried to revise history and retell their story on many occasions, but it is unlikely that those of us who witnessed the barbaric cruelty of the IFP in the early 1990s and have lost loved ones – massacred by Buthelezi’s followers while travelling on urban commuter trains or relaxing in their homes – will ever forget. As for the formerly glorious African National Congress, no one should dare blink and miss history being written right before our eyes as it gets eaten by an obstinate cancer from within. The next 12 months will determine if this oldest liberation movement will viably adapt to its new order after the sands would have settled. Much is at stake.